Tuesday, March 27 @9:00 a.m. There is a need to document hypoxic conditions (low dissolved oxygen) in the Long Island Sound and its embayments, as defined in the Long Island Sound Study’s Comprehensive Conservation and Management Plan. The Connecticut Department of Energy and Environmental Protection (CT DEEP) and the Interstate Environmental Commission (IEC) have been monitoring dissolved oxygen, as well as key water quality parameters relevant to hypoxia since 1991. The monitoring from 2017 showed the shortest hypoxic event. 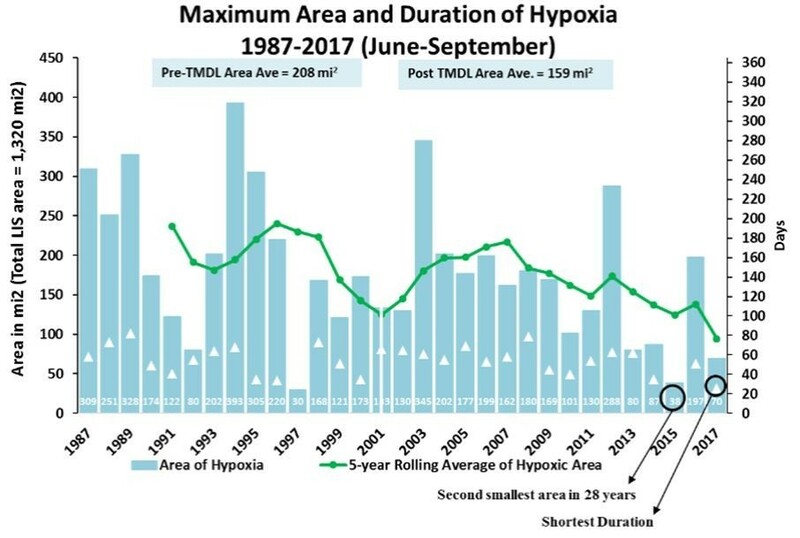 There has been a significant reduction of the hypoxic area in Long Island Sound, and compared to the previous 24 years, 2017 was the shortest event lasting 26 days and was well below the average of 53 days. A copy of the full report can be found here. For the latter part of the twentieth century, the Sound has been subject to the effects of increased nutrient loading. Seasonal weather patterns, particularly during the summer months, exacerbate the effects of nutrient loading, causing hypoxia in the Sound. Hypoxia negatively impacts the water quality of the Sound, the ecosystem services and resources it provides, and the habitat that is home to many species. In the early 1990’s, the Environmental Protection Agency, Connecticut and New York State adopted a nitrogen reduction target of 58.5% by 2017 to reduce nitrogen in the Long Island Sound from levels recorded in the early 1990’s. Hundreds of millions of dollars have been invested to reduce nitrogen by upgrading wastewater treatment plants that discharge nitrogen into local waterbodies, and as of 2016, New York and Connecticut nitrogen loads were below the Waste Load Allocations permitted by the plan, known as a Total Maximum Daily Load (TMDL). The Clean Water Infrastructure Act of 2017 established the State Septic System Replacement Fund and allocated $75 million to support a multi-year effort to replace aging septic systems in priority areas across New York State. Through a collaboration between the State Departments of Environmental Conservation and Health (DEC, DOH), and the Environmental Facilities Corporation (EFC), the State will support the new program in 31 counties with $15 million during its first year. To guide the funding and maximize water quality improvements, DEC and DOH identified priority areas eligible to participate based on the presence of a sole-source aquifer used for drinking water, known water quality impairments linked to failing septic systems, and the ability for septic system upgrades to mitigate water quality impairments. Funding for each county was based on population density, as well as the proximity of septic systems to drinking water sources. A list of eligible counties, priority geographic areas within those counties and first year funding allocations is available here. Suffolk County is earmarked to receive $10.025 million and Nassau County is to receive $1 million. The remaining funds will be divided up between the 29 upstate counties. Town of Brookhaven Supervisor and Long Island Regional Planning Council member, Ed Romaine announced that the Town has been awarded a $30,000 New York State DEC Planning Grant to prepare an engineered plan, map and report for a sewer collection system to connect the Greater Bellport Hamlet Center to Suffolk County’s Harrison Avenue Sewage Treatment Plant (STP). The plan, map and report will build upon the Greater Bellport STP Siting Options and Feasibility Study. Brookhaven’s 2014 Greater Bellport Land Use Plan presented the blueprint for a transit-oriented downtown supported by train and sanitary infrastructure. Brookhaven has aggressively pursued centralized wastewater treatment to protect the environment while stimulating economic development. The system design would have the potential to handle 75,000 gallons per day of wastewater from the Greater Bellport Hamlet Center, as well as an estimated 60,000 gallons per day from Bellport Village.